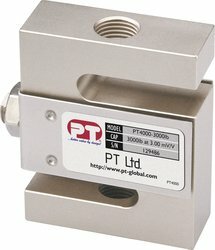 The PT4000 S-type load cell works in both tension and compression. It’s available in metric and imperial capacities and is offered in a wide range of capacities. All capacities feature a 3mV/V output built into rugged alloy tool steel with low sensitivity to axial loads. Sealed to IP67 and accepting standard US/EEC fittings, the PT4000 comes with a full range of mounting accessories. S-type load cells, also referred to as z-type, s-beam and z-type load cells are versatile and used in a wide variety of applications. Popular installations include mechanical scale conversions, materials testing, bi-directional, level and inventory monitoring as well as rope and chain strength testing, asphalt plants, bagging machines and hanging tanks, hoppers and silos.